You never know what you're going to find while out and about. Today I was location scouting in Demens Landing Park Downtown St. Pete and as I pull in to park, I saw a few ladies standing by a tree. One of the ladies was holding up a cell phone taking a picture of what looked like a statue. As I got closer, I realized it wasn't a statue. 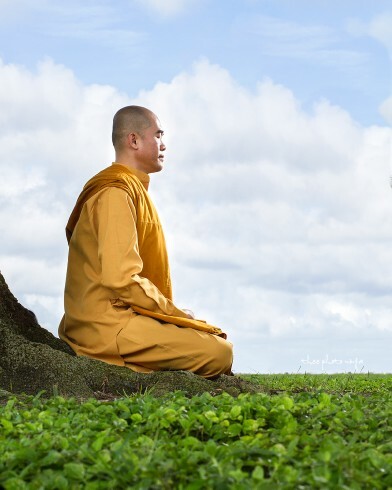 It was a Monk meditating under an oak tree. So, what goes through my mind was, "opportunity for a portrait of a monk meditating". I walk up to the ladies and introduced myself and asked both the ladies and the monk if it would be alright if I make a few pictures with my camera and a light, then send them a copy, since the quality would be better than their phone's camera. They said, "That would be great!" The battery on their camera had drained, so they had to use their phone's camera. I ran back to my car to grab my camera and light, mindful that I only had a few minutes to get a few pictures. As I came back, one of the ladies asked me where I was from. I said Vietnam. They all were from Vietnam, so we started speaking the language. That made it a bit more comfortable for them. I asked them which temple they were from. The ladies were from out of town. 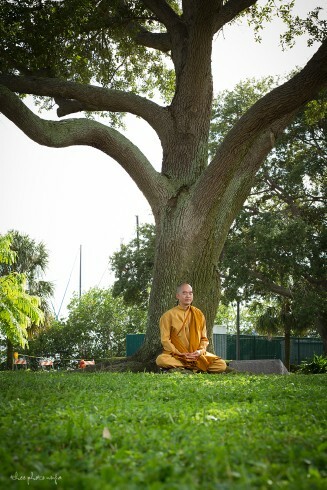 The monk was from the Buddhist Temple in Town N Country (Tampa). I told them that I've been there when the Jade Budda made its visit a few years ago. I spent about 7-8 minutes at most with them. 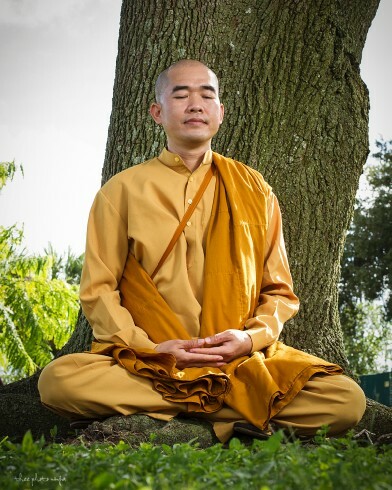 It was an honor to make a few portraits with the monk. I thanked them and they thanked me.